Vaccines induce memory B-cells that provide high affinity secondary antibody responses to identical antigens. Memory B-cells can also re-instigate affinity maturation, but how this happens against antigenic variants is poorly understood despite its potential impact on driving broadly protective immunity against pathogens such as Influenza and Dengue. We immunised mice sequentially with identical or variant Dengue-virus envelope proteins and analysed antibody and germinal-centre (GC) responses. Variant protein boosts induced GCs with a higher proportion of IgM+ B cells. The most variant protein re-stimulated GCs with the highest proportion of IgM+ cells with the most diverse, least mutated V-genes and with a slower but efficient serum antibody response. Recombinant antibodies from GC B-cells showed a higher affinity for the variant antigen than antibodies from a primary response, confirming a memory origin. This reveals a new process of antibody memory, that IgM memory cells with fewer mutations participate in secondary responses to variant antigens, demonstrating how the hierarchical structure of B-cell memory is used and indicating the potential and limits of cross-reactive antibody based immunity. Many devastating infectious diseases are caused by viruses that change over time. When a vaccine exists, it usually protects against a particular strain of virus, but often fails to defend against new versions of the microbe. This is why the flu vaccine has to be ‘updated’ every year, for example. Vaccines rely on the memory of our immune system. When a virus enters the body, a group of immune cells known as B cells gets activated. Certain B cells can recognise the invader and produce specific proteins, the antibodies, which can target and kill the invader. During the infection some of these B cells become ‘memory B cells’, having gone through a maturation process that hones their ability to specifically recognize this particular microbe. If the same virus enters the organism again, the memory B cells rapidly identify it and produce a quicker and more efficient immune response than during the first attack. This is how vaccines work. However memory B cells may not be able to recognize a previous intruder if it has changed too much. The memory B cell population is diverse. Some cells are fully mature and can quickly recognize the original virus. But others have not finished their maturation process: these cells are less focussed, and cannot target the original microbe with the same exact precision shown by mature memory cells. For almost forty years it was thought that this reduced focus might make the immature cells better at identifying new versions of the original attacker, but up until now, it was not clear what these memory cells could do. Here Burton, Tennant et al. injected a group of mice with proteins from the Dengue virus, which prompted an immune reaction. After several weeks, the animals received either the same proteins again, or proteins that were different. Compared to the fully mature cells, the immature memory B cells were much better at recognizing the variants of the proteins, and these cells then multiplied and mounted an immune response. Without the original protein injection, the response without the immature memory B cells was not as efficient. The body therefore has a pool of memory B cells that can recognise a wider range of virus protein variants than the ones that caused the first immune reaction. Understanding the role of immature memory B cells in immunity could help design vaccines that protect against several strains or fast-evolving viruses. This could have the potential to reduce the severity of diseases that affect hundreds of millions of people every year. Antibody-based immunity is underpinned by memory B-cells that have undergone antibody somatic hyper-mutation (SHM) and selection for improved antigen binding in germinal centres (GCs) (MacLennan et al., 1997). Re-challenge with the same antigen stimulates a rapid, higher affinity, secondary antibody response. Protective immunity to highly mutable viruses, like Dengue and Influenza, can be induced by vaccination but the high level of variation often leads to immune escape (Nabel and Fauci, 2010), leading to a focus on generating vaccine responses against conserved antigenic regions (Wu et al., 2010; Corti et al., 2011; Wang et al., 2015). Memory B-cells of IgM and IgG isotypes can also re-instigate GCs after secondary exposure (Dogan et al., 2009; Pape et al., 2011; McHeyzer-Williams et al., 2015), but how this happens against variant antigens is poorly understood despite its potential impact on driving the most broadly protective immunity. Several studies suggest diversity in the memory B-cell population, showing that cells can express IgM or IgG (Dogan et al., 2009; Pape et al., 2011), be mutated or non-mutated (Kaji et al., 2012) and have low affinities (Smith et al., 1997), but still persist in GCs (Kuraoka et al., 2016). It has long been speculated that this diversity may facilitate the recognition of antigenic variants (Herzenberg et al., 1980; Pape et al., 2011; Kaji et al., 2012) which could stimulate secondary GCs derived from less mutated, naïve-like, memory B-cells that still had an advantage over naive B-cells due to their increased numbers, pre-selected V-genes and lower activation thresholds (Good and Tangye, 2007; Good et al., 2009). By sequentially immunizing mice with the same or different Dengue-virus envelope proteins, and analyzing serum antibodies and GC B-cells, we provide evidence that supports the hypothesis that less developed memory B-cells are used in secondary responses to variant antigens. We chose Dengue-3 envelope protein (E3) for all priming immunisations. Boost immunisations were performed 38 days later with identical E3 protein or variant E2 or E4 proteins which have 68% and 63% overall sequence identity with E3, respectively. The cross reactivity of E3-primed mouse serum IgG correlated with sequence identity (Figure 1A), and overall cross-reactivity also correlated (Figure 1B). Serum antibody responses after boosting with Dengue envelope protein variants. (A) Cross-reactivity of E3 primed serum IgG with E-protein variants. Red bar shows mean value. Serum used was from mice mock-boosted with PBS 37 days after E3 priming and obtained 7 days later; E3, Dengue-3 envelope protein; E2, Dengue-2 envelope protein; E4, Dengue-4 envelope protein; % identity, sequence identity between E3 envelope protein and respective protein; end-point titre (EPT) values plotted are log2 of 1/(end point dilution x 100), each unit increase represents a doubling of titre. (B) E3 primed mouse serum cross-reactivity with E2 versus E4. (C) Control. Anti-PR8 HA serum IgG titre of E3 day 7boost serum. (D) Anti-E3 serum IgG titre after boosting with respective proteins. Red bar shows mean value. n = 6 from two independent experiments for each group except boost only, n = 3; first set of data points reproduced from panel A for comparison; numbers 3, 2 and 4 refer to serotype of Dengue-envelope protein used for boost; BO, adjuvant primed, E3 boosted, analysed 7 days later; Day, days after boosting. p-values calculated using two-tailed Students t-test after testing for equality of variance. (E) Anti-E2 serum IgG titre after E2 boost. Red bar shows mean value. n = 6 from two independent experiments for each group; labeling and statistics as for panel D. (F) Anti-E4 serum IgG titre after E4 boost. Red bar shows mean value. n = 6 from two independent experiments for each group; labeling and statistics as for panel D.
Boosting with homotypic E3 antigen induced a rapid antibody memory response with anti-E3 titres rising rapidly to day 7, and not increasing further (Figure 1D). E-protein boosted antisera was not reactive with an irrelevant His-tagged protein (PR8 HA)(Figure 1C). 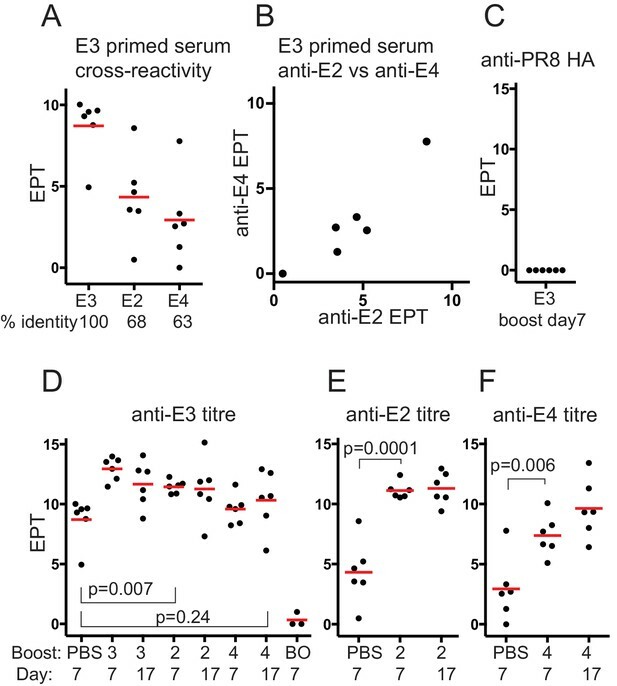 Heterotypic boosting with E2 induced a rapid and significant increase in anti-E3 titre, as might be expected if cross-reactive memory antibodies against the priming E3 antigen were recalled (Figure 1D), that did not increase further by day 17. E4 boosting induced a modest but not statistically significant increase in the anti-E3 titre, even by day 17, showing the E4 variant boost had not induced a significant anti-E3 antibody memory response, or the induced antibodies had a low affinity for E3 (see discussion). 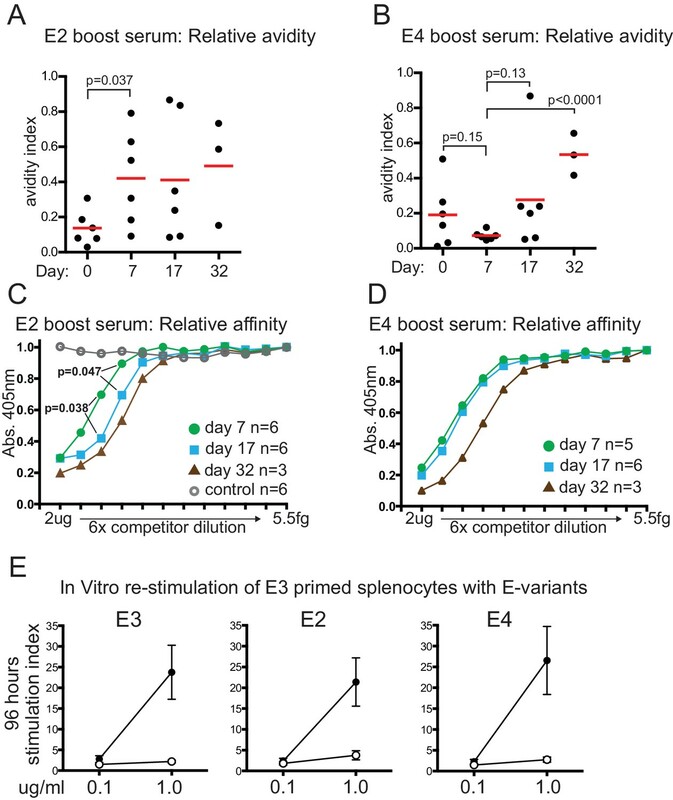 The anti-E2 titre induced by the E2 boost increased about 120-fold by day 7 (Figure 1E), and did not increase further by day 17, further indicating that E2 boosting induced a rapid memory-like serum IgG response against E2 derived from cross-reactive E3 primed memory B-cells. Conversely the anti-E4 titre, induced by E4 boosting, rose significantly but to a lower level, about 20-fold, by day 7 (Figure 1F) and showed a further rise by day 17. A boost alone did not induce a detectable antibody titre however, (‘BO’, Figure 1D) suggesting a role for memory B-cells of some type and/or cross-reactive T-cell memory, facilitating the E4 boost response. E3 and E2 boosting induced early GC B-cell levels similarly by day 7, to 4.5–5.5% of total lymphocytes, which then reduced by two-thirds by day 17 (Figure 2B). 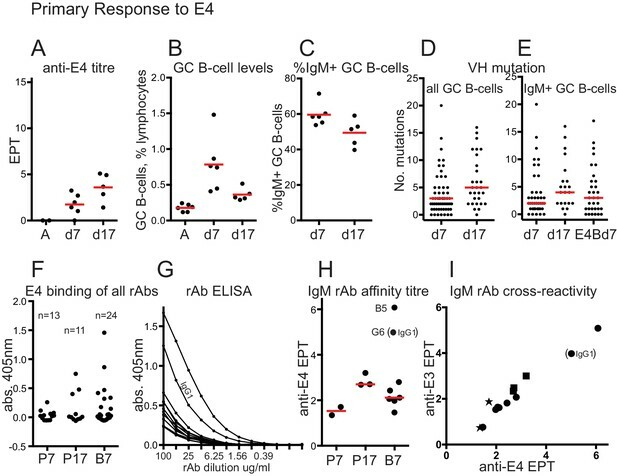 E4 boosting induced GC B-cell levels about a third as high, which then reduced similarly by about 60% at day 17, remaining 4-fold higher than controls. GC B-cell levels, isotypes, VH mutation and clonality after boosting with E-protein variants. (A) FACS gating strategy used to identify and sort GC B-cells and determine isotype. (B) GC B-cell levels after E-variant boosting, expressed as % total lymphocytes; Red bar shows mean value; numbers 3,2 and 4 refer to serotype of Dengue-envelope protein used for boost; BO, boost only, adjuvant primed, E3 boosted day 37, analysed 7 days later; Day, days after boosting. (C) % IgM+ GC B-cells, of total GC B-cells, after boosting. Red bar shows mean value. n = 6 from two independent experiments for each group; labels as for panel B except % identity which refers to sequence identity between E3 and other variants; p-values calculated using two-tailed Students t-test after testing for equality of variance. (D) Levels of IgM+ and IgM- GC B-cells in individual boosted mice. (E) Number of mutations detected in VH of all isotypes of GC B-cells, from n = 3 mice except E4 boost day 17, n = 2. Red bar is median value. VH region sequenced is CDR1 to FR3; labeling as panel B. (F) Number of mutations detected in VH of IgM+ GC B-cells, from n = 3 mice except E4 boost day 17, n = 2. Red bar is median value. (G) Clonality of sequences from single GC B-cells 7 days after boosting; colours indicate different mice in each group; thin sectors, unique sequences; thicker sectors two or three clonal sequences according to sector size; black dots, VH 14–3 or VH14-4 sequences; numbers in circles, number of sequences from that mouse; Identical VH clones had the same: V-gene, CDR3 length, J-gene, D-gene if assigned, D-reading frame, three or fewer differences in CDR3 amino acid sequence. Analysis of the proportion of IgM+ GC B-cells showed a highly significant trend at day 7 after boosting, with the proportion of IgM+ GC B-cells correlating with increasingly variant challenge (Figure 2C). This trend continued to day 17. The proportion of IgM+ B cells was also consistent between individuals in an experimental group (Figure 2D). Overall levels of VH mutations increased in all groups from day 7 to day 17 (Figure 2E), consistent with secondary affinity maturation. Sequences are available in Supplementary file 1. There were lower levels of SHM in IgM+ GC B-cells 7 days after the variant boosts, particularly with the most variant protein E4, compared to the homotypic E3 boost (Figure 2F). Boosting with variant proteins, therefore, induced early GCs with increased proportions of IgM B-cells that had fewer VH mutations. 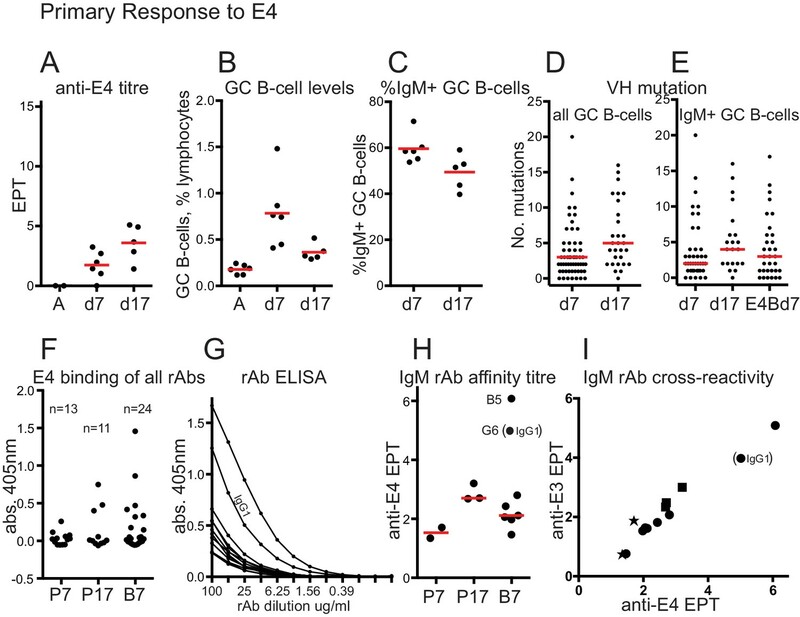 Analysis of the VH clonality of GC B-cells after E-protein boosts showed that almost every VH sequence was from a distinct B-cell clone (Figure 2G). These data also showed that the two variant boosts elicited different repertoires of VH. 40% of the VH sequences sampled at day 7 from E2 boosted mice were either VH14-3 or the closely related VH14-4 (black dots, Figure 2G), suggestive of a secondary response more focused on a particular epitope (see discussion). Some of these VH were also present in the homotypic E3 boost day 7 samples, but neither were detected at day 7 after E4 boosting (Figure 2G). E2-variant boosting induced an immediate and significant increase in avidity by day 7 (Figure 3A) which did not detectably change until perhaps day 32, although data variability is high. A modest but significant increase in serum affinity, however, was detected by day 17, with a further increase detected by day 32 (Figure 3C). We interpret this to mean that a relatively small portion of serum IgG underwent affinity maturation by day 17 in response to the E2 boost and was not detectable by the Urea avidity assay due to high variability and the high pre-existing IgG titres (Figure 1E), or other limitations of the Urea assay (Alexander et al., 2015). Boosting with the E4 variant elicited slower increases in relative affinity and avidity, only detectable by day 32, but by then representing an equivalent, if not greater, increase compared to that induced by E2 (Figure 3B and D). Relative serum affinity and avidity after boosting with E-protein variants, and T-cell re-stimulation. (A) Relative avidity of E2 boost serum for E2, measured by resistance to 7M Urea. Red bar shows mean value; Day, days after E2 boosting; Day 0 sample was from mice mock-boosted with PBS 37 days after priming with E3 and obtained 7 days later. (B) Relative avidity of E4 boost serum for E4, measured by resistance to 7M Urea. Labeling as for panel A; Day 0 sample was from mice mock-boosted with PBS 37 days after priming with E3 and obtained 7 days later (C) Relative affinity of E2 boosted serum for E2. Inhibition by lower concentration of competitor implies higher affinity of serum for competitor. Maximum competitor amount 2 μg in 50 μl followed by six-fold dilutions of competitor; timepoint of samples and numbers of individuals in group indicated. Open circles, E2 boost day 17 serum competed with irrelevant His-tagged protein measured on E2 target (D) Relative affinity of E4 boosted serum for E4. Labeling as for panel A. (E) T-cell proliferation measured by 3H incorporation 96 hr after re-stimulation in vitro with indicated amounts of E-protein variants; error bars indicate standard error of the mean; n = 4 or five from two independent experiments (see source data). Closed symbols, E3 primed mouse splenocytes re-stimulated with indicated E-protein variant. Open symbols, adjuvant primed mouse splenocytes re-stimulated with indicated E-protein variant. Memory T-cells are necessary for memory B-cell responses against haptens and viral proteins (Aiba et al., 2010; Hebeis et al., 2004). We found no evidence that the memory T-cell response to re-stimulation by variant E-proteins was any different from re-stimulation by E3 (Figure 3E). These data imply that a deficiency in T-cell recognition of these antigens cannot explain the differences in response to E2 and E4 challenge, and supports the idea that either T-cell receptors can recognize antigenic peptides from regions with around 50% sequence difference (see discussion) or, more likely, B-cells present peptides from different, more conserved regions than those their antibodies bind to. For comparison with the E4 boost response, we performed primary immunisations with E4 and analysed serum antibodies and GC B-cells at day 7 and day 17. Serum levels of anti-E4 IgG rose to a moderate level by day 17 (mean EPT = 3.6, Figure 4A), being less than seen after E4 boosting (Figure 1F). GC B-cell levels rose to a mean of 0.8% lymphocytes at day 7 after E4 priming, half as much as after the E4 boost, then fell similarly to the post boost samples by around 60% by day 17 (Figure 4B). As with the E-boost GCs, the proportion of IgM+ GC B-cells fell over time (Figure 4C) and levels of VH mutation in all B-cells and IgM+ B cells increased (Figure 4D and E). The median level of VH mutation in IgM+ GC B-cells at day 7 after E4 priming is less (=2) than after E4 boosting (=3) suggesting, not conclusively, that GC Bells at day 7 after E4 boosting are memory derived. Antibody titres were insufficient to do a relative affinity competition ELISA and no 7M Urea-resistant IgG was detected 7 or 17 days after E4 priming (data not shown). Primary response to E4 and rAb binding. (A) anti-E4 IgG titre after E4 priming; Red bars show mean titres; A, serum from adjuvant-only primed mice at day 45; d7, 7 days after E4 priming; d17, 17 days after E4 priming; EPT, end-point titre calculated as for Figure 1. (B) GC B-cell levels after E4 priming; Red bars indicate mean levels; A, cells from adjuvant-only primed mice 7 days after priming; other x-axis labels as for panel A. (C) %IgM + GC B-cells after E4 priming; Red bars show mean values; x-axis labels as for panel A. (D) Numbers of VH mutations in all isotypes of GC B-cells after E4 priming; Red bars show median values, from n = 3 mice (d7) and n = 2 mice (d17); x-axis labels as for panel A. (E) Numbers of VH mutations in IgM+ GC B-cells after E4 priming and boosting; Red bars show median values, from n = 3 mice (d7), n = 2 mice (d17) and n = 3 mice E4Bd7; x-axis labels as for panel A except E4Bd7, 7 days after E4 boosting which was 38 days after E3 priming. (F) ELISA screen of binding of all 48 rAbs. rAbs incubated at 100μgml−1. Number of rAbs in each group indicated. P7, 7 days after E4 prime; P17, 17 days after E4 prime; B7, 7 days after E4 boost. As the antibodies were cloned as chimeric human IgG1 antibodies the background from non-specific human polyclonal IgG binding has been subtracted from O.D. readings. Values in supplementary file 2. (G) ELISA titration of rAbs that showed binding O.D. > 0.1 in panel F. All but one were IgM. IgG1 rAb indicated. Background subtraction as for panel F, using appropriate dilution of polyclonal IgG. (H) Anti-E4 end point titre of positive-binding rAbs, used as a proxy of rAB affinity. X-axis labels as for panel F. End-point titre values plotted are log2 of 1/end point dilution (undiluted = 100μgml−1). Red bars show median values (excluding any IgG1 data). Stronger binding IgM rAb ‘B5’, and IgG1 rAb ‘G6’ EPT readings indicated. (I) anti-E3 versus anti-E4 endpoint titres. Star, E4 prime day 7 rAbs; Square, E4 prime day 17 rAbs; circle, E4 boost day 7 rAbs. IgG1 EPT reading indicated. End-point titre values plotted are log2 of 1/end point dilution (undiluted = 100μgml−1). If E4 boost induced B-cells are memory derived the antibodies should show evidence of pre-selection by the E3 prime. We made 48 recombinant antibodies (rAbs), 38 of which were IgM (supplementary file 2), 24 from E4 primed mice (day 7 and day 17) and 24 from E4 boosted mice (day 7). Figure 4F and Supplementary file 2, show the results from the initial screen of all rAbs against E4, indicating that the efficiency of detection of positive binding (deemed as O.D. > 0.1, useful for subsequent titration) was quite low but consistent with the 30–50% binding frequency of GC rAbs previously observed (Kuraoka et al., 2016), except for E4 prime day 7, which has only 2/13 rAbs binding strongly enough to be titrated. This might be expected of antibodies from a day 7 primary response GC, and indicated they were overall of lower affinity. Other rAbs from this group showed evidence of weak binding (supplementary file 2), indicating that the rAb cloning efficiency for this group was not reduced and only the two strongest binders were above the ELISA titration threshold. All but one of the positive binding rAbs were IgM. Figure 4G shows the ELISA titration and Figure 4H the derived endpoint titres, which we are using as a proxy of affinity. A more strongly binding IgM rAb from E4 boost day 7, B5, and the only positive binding IgG1 rAb, G6, are indicated on Figure 4H. The positive-binding rAbs from E4 prime day 17 show a higher affinity than those from prime day 7, consistent with affinity maturation. Six of the seven positive-binding IgM rAbs from E4 boost day 7 show a higher affinity than the two strongest binding IgM rAbs from E4 prime day 7. This is consistent with pre-selection by the E3 prime immunization, and also considering the higher proportion of rAbs with an anti-E4 O.D. > 0.1, implies the GC B-cells expressing these antibodies are memory derived. rAb affinities were generally low, which might be expected of IgMs particularly in early GCs. We estimated the Kd of rAbs B5 and G6 (an IgG1) as around 150 nm and 1 μm respectively (see Materials and methods). Other rAbs would be in the super-micromolar range. Figure 4I shows the cross reactivity of rAbs with E3. Binding to E3 correlates with binding to E4, but because of the generally low rAb affinities we suggest that the antibodies cannot discriminate between similar epitopes. The higher affinity of E4 boost rAbs B5 and G6, and binding to E3, suggest they may have genuine specificity for E3, thus consistent with their derivation from anti-E3 memory. That rAb B5 is an IgM with only one VH (and one Vkappa) mutation, provides further support for the proposal of this study. The most variant protein we boosted with, E4, stimulated GCs with the highest proportion of IgM+ cells and with the lowest levels of VH gene mutation, greater VH-gene diversity, and a slower, more specific, serum IgG response that resulted in equivalent if not higher affinity, compared to the heterotypic E2 boost. This response was higher than the primary response to E4. IgM rAbs cloned from E4 boost day 7 GC showed a higher affinity for E4 than those from E4 primed day 7 GC, implying they were memory derived. This demonstrates that IgM memory cells with fewer mutations, from ‘lower’ levels of the memory compartment, participate in secondary responses to variant antigens, and further challenges the hypothesis that highly mutated, class-switched cells elicited by homotypic antigen boosting are a ‘mirror’ of the antibody memory compartment (Weiss and Rajewsky, 1990). The slower nature of the E4 boost serum response also suggests a lower level of immediate differentiation of memory cells into AFCs than seen with for example the homotypic or E2 response, and is consistent with reduced numbers of high affinity class-switched memory cells recognizing E4. Naïve B-cells may contribute to the IgM+ GC B-cells we observe after E4 boosting, although the higher affinities of the rAbs from this group suggest many are memory derived. Also, the slightly higher median level of VH mutation and the higher levels of IgM+ GC B-cells after E4 boosting (2x) compared to priming, suggest IgM +memory B-cells are involved in the boost response consistent with the well established presence of IgM +memory cells with few or no mutations (Dogan et al., 2009; Pape et al., 2011; Kaji et al., 2012) and the known lower activation threshold of memory B-cells in response to antigen (Good and Tangye, 2007). Whilst E3 specific memory cells may be expected to increase the anti-E3 titre when stimulated by a cross-reactive E4 boost, the small but not significant effect we observe (Figure 1D) is consistent with the lowest affinity, least mutated, E3-specific memory cells being stimulated by an E4 boost. Antibodies from such cells may, therefore not add much to the already high, affinity matured, anti-E3 titre induced by E3 priming. The 14-fold higher anti-E4 titre at day 7 after boost (Figure 1F) versus day 17 after prime (Figure 4A) also argues for a significant contribution from B-cell memory. The fusion-loop epitope in domain 2 of the dengue envelope protein is 100% conserved between strains and in humans, antibodies against this are prevalent in cross-reactive secondary responses (Lai et al., 2013; Chaudhury et al., 2017). The E2 boost response is consistent with this effect, especially considering the restricted clonality seen in VH sequences, but the low anti-E3 titre induced by E4 is not. A recent study (Chaudhury et al., 2017) showed that the mouse response to recombinant E-protein is predominantly focused on domain 3 of the protein, and so cross reactivity with the fusion loop epitope (domain 2) should be less dominant. While E2 and E4 are 68% and 63% overall identical to E3, in domain 3, a focus of mouse antibodies, they are 62% and 51% identical, a bigger difference in differences, helping explain the responses we observe here. Female 8–11 week old BALB/c mice were purchased from Charles River, U.K. Primary immunisations were intra-peritoneal (IP) with 25 μg recombinant Dengue envelope protein (Biorbyt, UK) precipitated in alum with 2 × 107 heat-killed B.pertussis. Secondary immunisations were IP with 25 μg recombinant Dengue envelope protein (Biorbyt) dissolved in phosphate-buffered saline (PBS). At designated time points mice were anaesthetized and bled for collection of serum and then humanely sacrificed for collection of spleen cells. Dengue envelope (E) proteins were C-terminal His-tagged and expressed in E-coli prior to purification. Dengue proteins were tested for endotoxin by LAL assay (Fisher Scientific, UK) and contained it at a low level: E2, 5.4EU/μg; E3, 2.5EU/μg; E4, 3.1EU/μg. Endotoxin in this range does not give a detectable physiological response in mice (Copeland et al., 2005). Adapted from Puschnik et al., 2013. Assay plates were coated with antigen and blocked as for the ELISA protocol. 1/200 dilutions of serum in PBST/1% BSA were incubated on plates for 2 hr at room temperature. Wells were washed once with PBST, incubated for 10 min at room temperature with PBST or PBST/7M Urea, washed a further two times with PBST and then treated as for standard ELISA. The avidity index was calculated by dividing readings from 7M Urea treatment by readings from PBST-only treatment, after subtraction of background absorbance. Whole spleen cell-suspensions were red-cell depleted with Pharm-Lyse (BD Biosciences, UK) and incubated with anti-CD16/32 monoclonal antibody (Fc-block, BD Biosciences) for 15 min at 4°C. Cells were then stained with APC anti-B220, BV421 anti-CD38, PE anti-CD95/Fas (all BD) and FITC anti-IgM (eBioscience, Thermofisher Scientific, UK) for 45 min at 4°C. After washing, cells were re-suspended in PBS 5% FCS (Gibco, Thermofisher Scientific) and analysed or single-cell sorted on a FACS Aria II (BD). Single GC B-cells were sorted into half a 96 well PCR plate (less three control wells) containing10μl of chilled 10 mM Tris pH 8.0, 1 U/μl RNAsin (Promega, UK) and placed on dry ice then at −80°C. One-Step RT-PCR (Qiagen, UK) was performed according to manufacturers instructions, by adding 15 μl RT-PCR master mix, using first-round primer sets described in Tiller et al. (2009), with heavy-chain and kappa-chain primers, for 50 cycles, annealing at 53.6°C. Heavy-chain second-round PCRs were performed using 2 μl first-round product and the nested/semi-nested primer sets from Tiller et al. (2009), with Hot Star Taq polymerase (Qiagen) for 50 cycles annealing at 56°C. Second round PCR product (4 μl) was analysed on a 1.2% agarose gel. Successful PCRs were then Sanger sequenced. For this study the sequencing primer was the pan VH primer 5’MsVHE (Tiller et al., 2009) which leaves part of the 5’ of FR1 unsequenced. For this reason the FR1 sequence was not included in the analysis. VH sequence identification and SHM analysis was done using the IMGT V-Quest online platform. VH sequences are in Supplementary file 1. Further cloning, construction and expression of antibodies as chimeric IgG1 rAbs was done according to Tiller et al. (2009). Briefly, second round PCRs of in-frame VH and VK sequences were repeated with V-gene specific primers that included a restriction site for sub cloning (Tiller et al., 2009). These PCR products were purified (Qiagen), restriction digested, purified (Qiagen) and ligated (instant sticky-end ligase, NEB, UK) into the appropriate expression vector containing either human IgG1 or Kappa constant regions, prior to transformation into E. Coli NEB5-alpha (NEB). Expression constructs in transformed colonies were verified by sequence analysis prior to preparation of plasmid mini-preps (Qiagen). 293A cells were split and grown to 80% confluence in DMEM with ultra-low IgG FCS (PAN Biotech, Germany) in 150 mm plates prior to replacement of medium with 20 ml Panserin 293A serum free medium(PAN Biotech). 15 ug each of matched VH and VKappa constructs were added to 2 ml saline with 90 ug PEI, briefly vortexed and rested for 10mins. Transfection solution was added to plates and mixed gently. After 3 days medium was collected, centrifuged at 800 g for 10mins to clear debris, and further medium added. After a further 3 days medium was collected, cleared of debris as before and pooled. 100 ul protein-G sepharose (GE Healthcare, UK) was added to supernatants and incubated with rocking overnight at 4°C. Protein G sepharose was collected by centrifugation at 800 g for 10 mins and transferred in PBS to a PBS equilibrated spin column (Bio-Rad, UK). After 3 rounds of washing with 800 ul of PBS, rAbs were eluted in two 200 ul passes of 0.1M Glycine (pH2.9) into a tube with 40 ul of 1M Tris pH 8.0, 0.5% Sodium Azide. Antibody concentrations were determined by O.D. on a Nanodrop instrument (Thermo) and corrected for an extinction co-efficient of 1.36. Spleens were harvested from female BALB/c AnCrl mice 39 days after challenge. Splenocytes (5 × 105) were cultured in triplicate with the indicated concentration of E-protein in X-VIVO 15 medium. Cells were cultured for 96 hr and 0.5 μCi of [3H] thymidine was added to wells for 16 hr before measurement with a 1450 MicroBeta counter (Wallac, Perkin Elmer, UK). For statistical analysis sample sizes were chosen to address group size reductions that observe the ARRIVE guidelines. Cages of three mice were randomly allocated to treatment groups. These group treatments were independently biologically replicated to give a sample size of 6. Where statistical analysis was applied, data points were analysed with Levene’s test for equality of variance and where violated they were subject to a two-tailed Students t-test for unequal variance, otherwise the two-tailed t-test for equal variance. What do chaotrope-based avidity assays for antibodies to HIV-1 envelope glycoproteins measure? PLoS Neglected Tropical Diseases 11:e0005395. Clinical and Vaccine Immunology 12:60–67. The Journal of Immunology 182:890–901. The Journal of Experimental Medicine 199:593–602. Journal of Experimental Medicine 151:1071–1087. The Journal of Experimental Medicine 209:2079–2097. PLoS Neglected Tropical Diseases 7:e2451. PLoS Neglected Tropical Diseases 7:e2274. Journal of Immunological Methods 350:183–193. Journal of Experimental Medicine 172:1681–1689. Thank you for submitting your article "Variant proteins stimulate more IgM+ GC B-cells revealing a mechanism of cross-reactive recognition by antibody memory" for consideration by eLife. Your article has been reviewed by three peer reviewers, one of whom, Arup Chakraborty, is a member of our Board of Reviewing Editors and also acted as the Senior Editor. In this paper, the authors study whether cross-reactive memory B cells re-instigate GCs upon sequential immunization with variant antigens. They also study which types of memory B cells initiate such GCs. Toward this end, they prime with a particular strain of dengue virus envelope protein (E3) and then boost with either one of two variants, E2 and E4. E2 has 68% sequence identity with E3 while E4 has 63% . Memory B cell cross reactivity has been previously discussed by several groups, but the present study could be valuable in showing its existence in virus polyepitopic antigens, rather than the monoepitope hapten-carrier system. The main finding is that variant proteins (dengue virus) tend to induce germinal centers (GCs) with higher levels of IgM+ memory B cells than the wild type immunizing protein in a mouse model. The most variant protein induced the highest proportion of IgM+ memory cells and a slower IgG response. These findings are potentially interesting and valuable. However, some significant concerns that need to be addressed are noted below. Some of these points involve making clarifications or elaboration of existing data, and only a few new experiments are required. 1) One major criticism is that the authors are not able to determine whether the IgM+ GC cells are derived from activated naive B cells or from IgM memory B cells. They also do not clone any mAbs from the GC B cells to analyze binding cross-reactivity (only sequence data is shown). The paper would be considerably stronger with this data. 2) Figure 1 D and F: The authors show that boosting with E4 did not significantly increase the serum titer to E3 at day 7 or 14. However, the anti-E4 titer rose significantly by day 7. Since a boost alone did not induce a detectable titer by day 7, the authors conclude that the E4 boost response is due to cross-reactive memory cells rather than naïve B cells. If this is the case, how do the authors explain the lack of rise in the E3 titer after E4 boosting? Presumably any cross-reactive memory B cells would have been first induced by the E3 prime and therefore should also cross-react with E3. Furthermore, the fusion loop is 100% conserved between the four serotypes of dengue, and previous studies have shown that this antigenic region is immunodominant in the context of a secondary response. Given this, it is surprising that there are apparently few to no cross-reactive memory B cells in the E3 primed mice that are recalled in response to E4 boost. The authors should comment on this unexpected finding. A related point is why slightly different sequence identities between E2 and E3 and E4 and E3 resulted in such big differences. A description of how E3, E2 and E4 differ in their antigenic epitopes might help clarify these points. 3) Previous studies have shown that IgG memory B cells have an increased propensity to differentiate into plasmablasts, whereas IgM memory cells preferentially enter GCs. Did the magnitude of the plasmablast response in the spleen or blood of the immunized mice differ between the E3 boosted mice versus the E2 or E4 boosted mice? 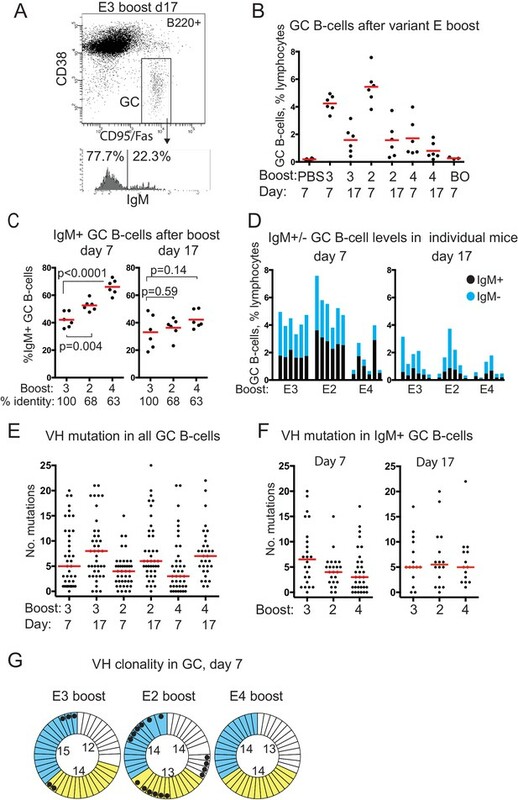 4) It is interesting that the level of VH mutation (Figure 2F) in IgM+ GC B cells on day 7 (post-boost) is lowest in the E4 boosted mice. However, it is unclear whether these IgM+ B cells originate from naïve or memory B cell precursors. How do the average levels of SHM in these cells compare to the day 7 levels of SHM in IgM+ GC B cells of mice that were boosted with E4 in the absence of an E3 prime (i.e. a true naïve response)? 5) The authors show that the VH sequences sampled at day 7 from the E2 boosted mice were biased toward two VH germline genes. Since these VH were also present in the homotypic E3 boost day 7 samples, the authors conclude that these cells likely originate from E3-induced memory B cells. Although these data show that there is significant skewing in the E2 boosted mice, there are very few B cells in the E3 boosted mice that utilize these V-genes (depending on the mouse). For example, there is no VH14-3 usage in mouse#1, that 1 out of 14 VH genes sequenced (joined with J4 and IgHD2-1*01) in mouse #2 and that 2 out of 15 VH genes sequenced (joined with J4 and either with IGHD2-12*01 or IGHD2-14*01) in mouse #3. This sequencing data is not strong enough to support the conclusion that antibodies utilizing these germline genes are derived from cross-reactive memory B cells. 6) Figure 3. The authors claim that the boost with E4 elicited a slower, more "naïve-like" response compared to the E2 boost. However, without showing the responses in a E4 immunized mouse that did not receive an E3-prime (a true naïve response), this conclusion is not strongly supported. 7) In Figure 3 A and B, the competition assay for affinity measurement in E2 or E4 boosted serum for E2 and E4 target, respectively, is complicated and not accurate. The authors should perform antigen-specific ELISAs for the anti-Dengue antibodies, both in the absence and in the presence of urea 7M. This is a well-established assay used to test antibody affinities (Wong-Baeza, et al., Frontiers in Immunology. 2016, Khurana et al., Sci Transl Med, 2011; Puschnik et al., PLoS Negl Trop Dis, 2013; Westerlund et al., Clin Exp Immunol, 2007). Thank you for submitting your work entitled "Variant proteins stimulate more IgM+ GC B-cells revealing a mechanism of cross-reactive recognition by antibody memory" for consideration by eLife. Your article has been reviewed by an original reviewer, and the evaluation has been overseen by a Reviewing and Senior Editor. Our decision has been reached after consultation between this reviewer and the editors. Based on these discussions and the individual review below, we regret to inform you that your work will not be considered further for publication in eLife. In short, we think that two major points raised in the first review were not addressed. Also, we feel that addressing these points will take you a long time, and so it is best to consider publication in another journal. In their revised manuscript the authors made some progress in that they improved some parts, however, they failed to rectify the major weakness present in their main messages, a fault which renders the manuscript unacceptable. Therefore, unfortunately, I am unable to recommend this article in its present form for publication in eLife. 1) The authors failed to present a clear solution to the comments raised in point 1 and point 4. The authors described that they have not identified a possible contribution of naïve B-cells to the IgM+ GC B-cells they observed after E4 boosting. But at the same time, the authors could also describe that they have not identified a possible contribution of memory B-cells to the IgM+ GC B-cells they observed after E4 boosting. There is no significant deference between the median level of VH mutation in the primary and secondary response and cross-reactive response to E4. The% of GC B-cells after E4 boosting is slightly high compared to priming, but the authors should pay attention to the previous report indicating that B cells can colonize heterologous GCs and that GCs are dynamic anatomical structures that can be reutilized by newly activated B cells during immune responses (Schwickert et al., J. Exp. Med. 205, 2907). Thus, the revised manuscript does not give any productive messages to the readers and it does not match the contents presented in the Abstract. As the authors stated in their reply, this issue should be resolved using specificity analysis, at least, by cell transfers, which is perhaps one of the easiest experiments to perform. 2) The authors did respond to the criticisms raised in point 6 and point 7. These tasks improved the manuscript to clearly show that the E4 cross secondary response induces an anti-E4 IgG secondary antibody response. Relative avidity measurement by two different assays (Figure 3B and D) does not match the timing in the avidity maturation in the response, but these results show the affinity maturation in the anti-E4 IgG response, probably in the secondary response. Thank you for submitting your article "Variant proteins stimulate more IgM+ GC B-cells revealing a mechanism of cross-reactive recognition by antibody memory" for consideration by eLife. The evaluation of your manuscript has been overseen by Arup Chakraborty as the Reviewing and Senior Editor. The results are of importance for vaccination and affinity maturation, as we have said before. There is only one important issue that needs to be addressed. According to the new data presented in Figure 4F and H, you claim that IgM antibodies from the early E4 boost GC (B7) have higher affinities for E4 than IgM antibodies from the early E4 primary response GC (p7). You assume that IgM antibodies from the early E4 boost GC (B7) are pre-selected by the prior E3 primary immunization, as are memory cells.However, Figure 4H shows that only one IgM antibody showed higher affinity, but other IgMs did not. Can you please provide additional data points to support this conclusion? We thank you for making this comment. In response we have undertaken an analysis of the primary antibody and GC response to E4. We have added a new figure and section in results to report this. The levels of VH mutation in IgM+ GC B-cells at day 7 after E4 boosting were low anyway (median = 3). Levels of VH mutation 7 days after E4 priming were median = 2, which is lower and suggests that the IgM+ GC B-cells in response to E4 boosting are at least in part memory derived, but this on its own is not conclusive evidence. 7) In Figure 3 A and B, the competition assay for affinity measurement in E2 or E4 boosted serum for E2 and E4 target, respectively, is complicated and not accurate. The authors should perform antigen-specific ELISAs for the anti-Dengue antibodies, both in the absence and in the presence of urea 7M. This is a well-established assay used to test antibody affinities (Wong-Baeza, et al., Frontiers in Immunology, 2016, Khurana et al., Sci Transl Med, 2011; Puschnik et al, PLoS Negl Trop Dis, 2013; Westerlund et al, Clin Exp Immunol, 2007). This is a very valuable point and we have performed a relative avidity assay/7M Urea resistance assay on the serum samples that enhances this study. We consider, however, that these two assays measure different things. Resistance to 7M Urea is measuring the avidity of a divalent binding of antibody to immobilized target. The competition assay we have used is more a measure of relative affinity as it is measuring the ability of monovalent interactions between antibody and E-protein in solution to inhibit the binding of the antibody to the immobilized E-protein target. For this reason, and because doubts about the quality of the Urea resistance assay have recently been raised (Alexander et al., 2015), particularly with respect to antibodies against conformational epitopes, which are present on E-proteins, we have included both assays in the revised article and modified the Results section accordingly. After E2 boosting there is a rapid increase in serum avidity by day 7 detected by the Urea assay and no apparent further increase until day 32 perhaps, although data variability is high at day 7 and 17. The affinity for E2 measured by competition assay, however, increases from day 7 to day 17. We interpret this to mean that only a small portion of serum IgG has undergone affinity maturation by day 17, which is plausible because of the high levels of serum IgG already present, so it would not be detected by the Urea assay, particularly with the high data variability seen with this assay at these time points, but would by the competition assay. If this were the case (that a minor portion of serum IgG had affinity matured) the competition assay may discriminate less between E2 boost day 7 and day 17 samples at the highest competitor concentrations and this is what we observe. Another explanation for the lack of detectable improvement in avidity for E2 between day 7 and day 17 is that some or all of the affinity matured IgG is against conformational epitopes vulnerable to 7M Urea. Both assays show a slower, but equivalent, if not greater, increase in affinity/avidity for E4 after E4 boost compared to affinity/avidity for E2 after E2 boost, which is an important observation. In Revision 1 we attempted to address point 4 by analysing SHM levels as suggested but the results were inconclusive. Both these points could be satisfactorily addressed by the analysis and comparison of recombinant antibodies from GC B-cells after E4 priming and after E4 boosting (after E3 priming), which we have now done. With our new data we show that IgM antibodies from the early E4 boost GC have higher affinities for E4 than IgM antibodies from the early E4 primary response GC, implying they have been pre-selected by the prior E3 primary immunisation, and so are memory cells. This provides further and clear evidence for the main proposal of the study, and much improves it as suggested by the referee above. We are reporting about antibodies from B-cells, which have not been selected for antigen binding in vitro, from early in the response. Little is known about these. Whilst we measure clear differences in rAb affinity, overall the affinities are low, as would be expected from early GC. Analysis of specificity shows that the rAbs recognise E3 and E4 similarly, even from E4 primed mice. We suggest that at these affinities antibodies can’t discriminate between similar epitopes. This provides a starting point to debate the meaning of ‘cross-reactivity’ in antibody memory, of importance for the understanding of for example the generation of bnAbs against HIV, the germline precursors of which have similar affinities to our rAbs. We have previously submitted the second revision, but some issues came to light regarding the clarity of the data presentation in Figure 4, as this figure contained panels with data points and labels that were not fully explained in the main text and figure legend. We have now amended the main text and relevant figure legend to clarify this matter. We are especially grateful to the late Michael Neuberger for critical discussion and early comment on the project. Thanks to Patrick Wilson and Christian Busse for advice on single cell antibody PCR, Per Klasse for advice on antibody avidity assays, James Cresswell for advice on statistics, Kai Toellner for discussions and Jamie Gilman for extra FACS work. Animal experimentation: All animal experiments were done following the ARRIVE guidelines under authority of UK Home Office license PPL 30/3089, with permission from University of Exeter, UK, local animal welfare ethical review board. Blood samples were taken under Ketamine and Xylazine anaesthesia and every effort was made to minimise suffering. © 2018, Burton et al.